Are you looking forward to share and find tips and experiences with all over Sweden lovers? CommunityOfSweden.com - the official online community for Sweden is going to make the best of the first online communities for Sweden country! According to the web site: "Here you can share and enjoy photos, travel stories tips and more from friends in Sweden and all over the world. Internet users are keen to tell others about their travel experiences and share information about their favourite places. CommunityOfSweden.com will be the link between the people who know and love Sweden, and those who are curious to learn more. CommunityOfSweden.com is a part of VisitSweden.com VisitSweden.com is the official website for Sweden as a tourist destination. " Remember, some times ago, I make a interview with Tommy Sollén, project manager and official Community Driver. 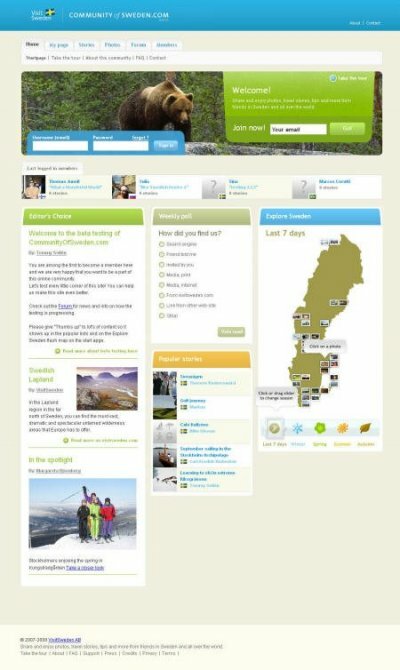 Today, the web site is still in Beta version, but look great, with potential and you can already feel passion & motivation from the VisitSweden.com team. CommunityOfSweden.com is powered by http://www.trive.se/, a European leader in online web community consulting. "The community is live! It is going to be wonderful to see it develop over time and find out what you will make of the framework we have provided for you. I look forward to all the valuable feedback we will be getting from our early members through this beta launch. Hope you enjoy it!"